McCain vs Obama: who's got the best band? It's a US election music special! 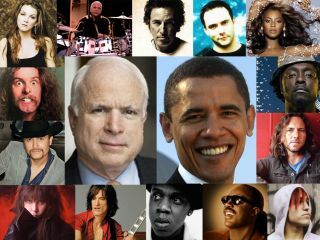 As America's voters decide today on their next president in either John McCain or Barack Obama, MusicRadar has decided to cut through the guff of celebrity endorsements and get to what really matters: the music. Many musicians have their own views on who is the best candidate and what they each think of Republican and Democratic policies. But MusicRadar has pointed a laser beam on perhaps the single most pressing issue of this campaign season (to us, anyway): If McCain and Obama had house bands of their muso supporters to play at their inauguration, which would really freakin' rock? With political prejudice put to one side, we're concentrating on musical and performance chops rather than those of a pork-belly variety. So here's MusicRadar's special. We've studied the stars' allegiances, auditioned the players (on paper and YouTube, at least), and built our perfect lineups of McCain and Obama 'bands'. With Raisin McCain, country star John Rich has written one of the most explicit support songs for Vietnam veteran McCain. We're going to put him in the big White House"
Partly on strength of numbers, but also on skill, Barack's B Street Band take it. And if the politics doesn't work out for Obama, maybe he can start a career in rock'n'roll with his new friends? Rock'n'roll always gets our vote.